Module 1: Getting Started - learn your way around this course and getting to know your classmates. Module 2: What is allegory? - Learn what allegory is and view examples. Module 3: Developing Background - Dig into the background information about about Russian history that you need to understand the allegory of Animal Farm. Module 4: Understanding the Allegory, Part 1 - In this module we will analyze part of the allegory of Animal Farm by comparing and contrasting the novel to Russian History. Module 5: Understanding the Allegory, Part 2 - In this module we will look at another part of the allegory of Animal Farm by comparing Animalism in the novel to Communism. Module 7: Creating Your Own Allegory - In this Module, you will get the chance to choose your own topic and write a short allegory explaining it. Module 8: Wrap-up and Review - This module will review what we've learned and give you an opportunity to reflect o your learning. This course is about "allegory". We will learn more about allegory in Module 2, but for now know that an allegory is a piece of writing that has a hidden meaning that is usually moral, political, or spiritual. 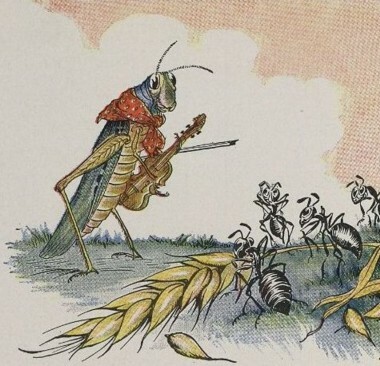 Take the story of The Grasshopper and the Ant. On the surface it is the story of a grasshopper who likes to play and never work, and because he was so lazy, he had no food in winter and dies. His buddy the ant, after his hard work, has plenty to eat over the winter and survives. However, if you change the animal characters into people, suddenly the story seems to be more about lazy people and hardworking people. The story seems to teach us that hard work will bring us success and security, and being lazy will lead to failure. Reading a story like this is called reading allegorically. It is different than reading literally. These are just a few of the things we will learn and practice during this course. Why is it important you ask? Because allegories are everywhere. Some of the greatest stories ever told are allegories. your life will be richer and you will be smarter for being able to find and understand them. So what are you supposed to do when you start a module? Well, you should first go to the module introduction page like this one you just read for Module 1. You can find those links at the top of the website in the horizontal navigation bar. That page will give you the complete instructions and tasks for the entire module. All the information you need for what needs to be completed and where it can be found on that page. Again, it is important to do all modules and lessons in order. Don't understand something? Need something explained? Not sure how to do something? Don't waste your time, get help! Help while taking this course is only an email away. Just contact the instructor at anytime. Furthermore, note that there are many helpful resources available on the Course Resources page to help you do well in this course. Now take a look around the course and learn what's where with this quick and super easy Course Scavenger Hunt. To complete the Scavenger Hunt, follow the directions below. Use this course website to answer the questions in the document.